In this article you will know everything about RTIC coolers lineup. RTIC manufacturer is one of the most popular brands in the world coolers market and its quality is already proven over many years. This manufacturer has created different coolers for different users. Among the production that is manufactured by this brand you can find hard coolers, soft coolers and different accessories. This article is devoted to soft coolers lineup. If you are interested in the lineup of hard ice chests by RTIC we recommend you to read about them in our previous RTIC cooler review article. Despite the fact that the quality of all RTIC coolers doesn’t need any evidences, the hard coolers from RTIC are not as convenient as their soft coolers. All hard coolers always have such disadvantages as extra weight and bulky form, and in the most of cases their transportations is not as simple and convenient as in the case of using soft coolers. Soft coolers made by RTIC have achieved the title of the best coolers on the market. A little bit further we will tell you what characteristics have lead these coolers to such high position. In this article we gonna tell you about all pros and cons of the RTIC soft coolers and try to compare them with other options. So, if you are interested, welcome to our RTIC SoftPak review and be ready to start a new life with your new RTIC soft cooler! RTIC SoftPak Review. Let’ s look deeper. RTIC coolers can easily hold you beverages cold during much longer terms in comparison with other coolers. In this paragraph we will tell you all secrets of such effective work and consider deeper what is the construction of RTIC coolers. We hope that our review will help you to male a choice. So, let’s start! What I Will Receive After Shipping? One great advantage of all soft coolers is that they are SOFT. It is funny, but it is really a great pros when we talking about transportation. Soft coolers will not be damaged after transportation and shipping process. So, what will you see after receiving so long-awaited box? When you receive your long-awaited box you will see your new cooler in a special bag for safe transportation. Together with new cooler you will get shoulder strap for easily transportation and lubrication for cooler’s zippers. One more great pros of soft RTIC cooler is that you don’t need any special preparation before using it. In fact you can use it after taking from the shipping box. But don’t forget to fill it with ice, ha. So, add an ice in your new beautiful cooler and you can start your trip. Soft coolers made by RTIC a little bit differ from ordinary soft-sided options available at local stores. But no, we are wrong. RTIC coolers SIGNIFICANTLY differ from them. Immediately after taking a RTIC cooler you will notice the highest-quality of its material and its perfect build. It will not take you a lot of time to understand that these coolers are excellent. With highest quality and durability you will not regret about your choice. Our team from best-cooler.reviews has already mentioned the RTIC production in our previous articles. You can read our posts about RTIC hard coolers , RTIC koozie review, and the RTIC soft coolers in this article. Thus, if you are interested in other products from this famous brand after reading this article you can check other options in these previous articles too. But, now we are speaking about soft coolers. Let’s continue our review. RTIC coolers are famous by their ice retention terms. The long duration of their ability to hold an ice inside is caused by good insulation of each cooler. Thanks to the fact that soft coolers are made of much more flexible material comparably with hard ice-chests, their insulation is different. 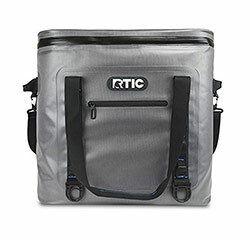 The RTIC soft coolers are equipped with two inches of special insulation foam that is also used in wet suits. Such type of insulation foam is well known by its excellent ability to resist water and to hold cold inside. Insulation of RTIC soft coolers is much thicker in comparison with other soft coolers. You will notice it when open your new cooler. The thick insulation layer provides you with longer ice retention periods comparably with thinner-insulation layer of other coolers. Many people have misconception about soft coolers. They think that soft coolers are not as durable as hard coolers are, only because their softness. But they are mistaken. The RTIC coolers are made of extremely durable nylon shell that is puncture resistant and can withstand extreme weather conditions. This feature distinguishes RTIC brand coolers from other available nowadays soft-coolers. In fact RTIC soft cooler is not a usual soft cooler that you are used to see, this is something more than normal traditional soft cooler. More durable, more effective, more convenient. These coolers can become a great component of your next fishing, hiking or your campsite. You should not worry about their transportation because with durable handles and convenient shoulder strap it will be incredible easy. One more great advantage of RTIC soft coolers is their ability to hold its content safe and secure. There are many situations when people claim that when using their soft coolers they have found liquid that was leaking from the cooler in all directions. With RTIC coolers you will not face with such problem thanks to availability of waterproof zippers that can hold the content of your cooler in completely safety and protect cooler from leaking. These zippers are waterproof and durable. In addition to this, as it was mentioned above, when purchasing a RTIC soft cooler you will get a special zipper lubrication that will prolong the lifetime of zippers and protect them from wearing over the time. Thus with such addition you will not have to replace zippers after several years of using your cooler. Like it was already mentioned above, the RTIC soft coolers are not as ‘soft’ as usual soft coolers options. These coolers are made of laminated fabric and durable welded seams that add toughness to RTIC coolers and make them extremely durable in comparison with other softer coolers. RTIC SoftPaks are ready to every extreme adventure wherever you decide to take them. They will withstand all severe conditions and don’t let you down. The most important moment when considering each coolers lineup is their duration of ice retention. So, the most exciting moment…how long RTIC soft coolers are able to keep ice frozen? Thanks to previously considered thick insulation and waterproof zippers these coolers can hold an ice inside for 5 days and more. The exact duration of this term depends on the storing and weather conditions. The term of ice retention of RTIC soft coolers is not the maximum among all coolers available nowadays, but in comparison with other SOFT coolers, it is rather long term and together with that, it is a very good feature of these coolers’ quality. The first representative of RTIC soft coolers lineup is the RTIC SoftPak 20 that is the smallest option in this line. It is a great variant for one-person trip. You can put in this cooler all drinks and food that you will need during the whole day and find them cold and fresh whenever you want to sip a lemonade or to taste sandwich. Thanks to such small size this cooler has rather light weight and is very easy to carry even when it is filled. The size of this cooler is 14” x 13 ¼” x 9 ¼” that is enough for 30 cans with your favorite drinks. Such small size of this soft cooler is very convenient to take it to work as a lunch box, to the picnic or barbecue, or just to weekend-trip. You can use it only for yourself or its size will also be enough to take some cans with Coca for couple of your friends too. Good, durable, high-quality and very convenient and portable option with high-end characteristics and modern design. > Check the current price on Amazon. If the previous RTIC SoftPak 20 model is too small for you, RTIC manufacturers offer a little bigger option. RTIC SoftPak 30 occupies the middle position among coolers from RTIC SoftPak lineup. This cooler will fit longer trips or larger groups of people. You can take it to the camping with your friends or to other outdoor activities where will be more people than you and your friend. This cooler is a little heavier than the previously described variant. The weight of the empty RTIC SoftPak 30 is four pounds. The size of this model is 13.5” x 15” x 11 ¼”. This cooler can hold up to 30 cans with beverages for you and your friends. As we have already mentioned above each representative of RTIC soft-coolers is more, than other soft coolers available nowadays. RTIC coolers are durable thanks to their construction. Each cooler is wrapped in a vinyl shell that makes it much more durable than any other options. This option will ideally fit for people who like big parties, or to companies of friends who like camping or fishing trips. You can also take it to your next hunting, this cooler will hold your game fresh during several days. >> Check the current price on Amazon. The last one cooler is one list is the largest option in the RTIC soft coolers lineup. 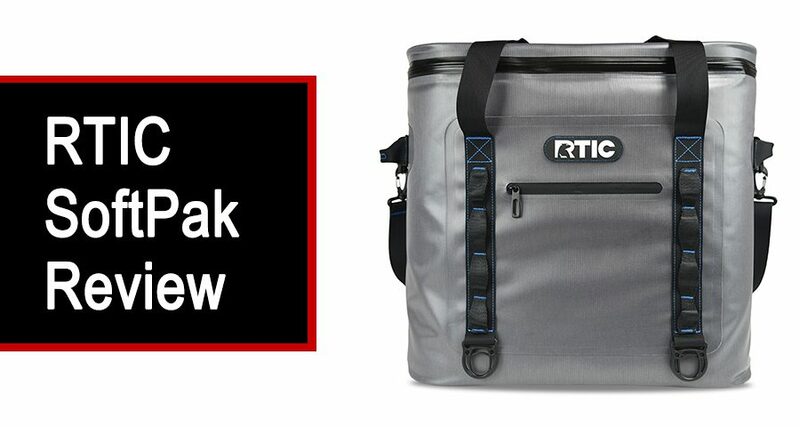 The RTIC SoftPak 40 will fit you if you are searching large and qualitative cooler for long trips or big companies. The weight of this cooler as well as its size is the biggest. Empty RTIC SoftPak 40 weights 5.5 pounds. But you shouldn’t worry about it, because despite of its weight, this cooler is convenient to carry thanks to durable carrying straps that will help you to carry it without significant efforts. 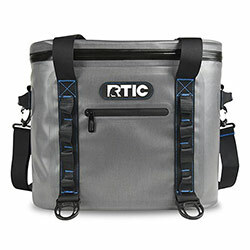 The size of the largest cooler offered by RTIC is 17 ½” x 18” x 11 ¼”. This cooler surprises its capacity. After purchasing this option you will get a storage space of 40 pounds of ice that will be enough for two cases of drinks. This option has the best capacity of representatives the of RTIC soft coolers line. The great advantage of this cooler is its ‘softness’. Any other cooler with such large size and big capacity will be bulky and inconvenient, while the RTIC SoftPak 40 thanks to its soft walls is convenient to transport and has rather compact form. With such large cooler you are able to go to a long fishing trip, or to several-day hunting, or even make a grandiose party for your friends where you will hang out for a couple of days. 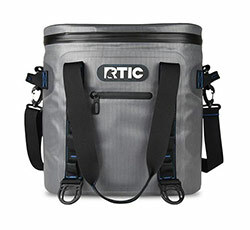 Nowadays you can find RTIC soft coolers in two different colors: camo outer shell or grey. In many cases coolers’ owners have a problem of leaking water from their coolers when ice starts melting. With the special RTIC coolers exterior that prevents leaking you won’t be leave water spots on all surfaces where you put your cooler. Thanks to unique material with waterproof properties you won’t be afraid no more to spill your drinks inside the cooler. You will be able to clean it up very easily and find it dry and clean in a short period of time. Appearance of the mold inside a cooler is very frequent problem especially if you often use your cooler. RTIC coolers are equipped with the special liner which has anti-microbial properties. RTIC coolers are equipped with the convenient two-inch lid that gives you an easy access to the content of your cooler. The access will be much easier in comparison with othercoolers that are equipped with less thick lids. For What Purposes Are the RTIC Soft Coolers Created? Nowadays there are coolers for trips, work, parties, hunting or fishing. RTIC coolers can fit any of these categories. You can take the small options of them to the picnic or for a work, while larger sizes fit ideally to longer trips, fishing, hunting or tailgate parties. These coolers can be called ‘multitasking’ as there are not any strict rules where you can use them and where you can’t. This cooler will become a reliable friend in each your trip and will be able to hold cool drinks and food for you and your friends for long time period. 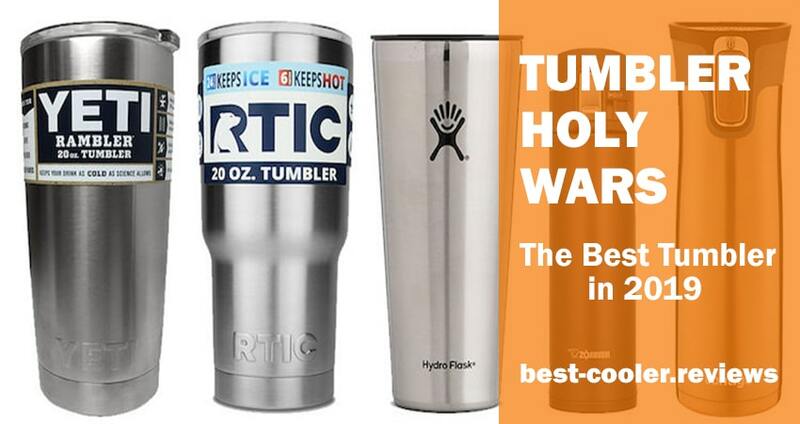 RTIC soft coolers and Yeti coolers are the main competitors in the diversified coolers world. 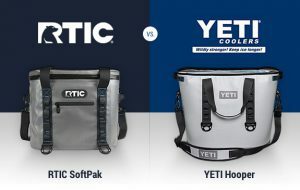 In this paragraph we have decided to compare Yeti Hopper and RTIC Softpack to clarify the main differences between them and to show all their pros and cons. Let’s start this battle and make the best one be the winner! The most important characteristic that always clarify the ‘TOP level’ of the cooler immediately is the duration of its ice retention period. 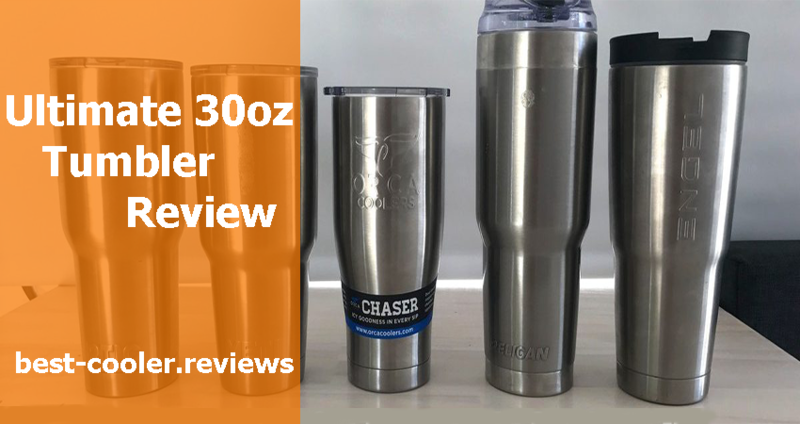 Manufacturers of Yeti coolers have decide to evade this information and wrote on the Yeti’s website that there are a lot of factors that can change ice retention of Yeti coolers. At the RTIC website manufacturers decided not to hide any information and affirm that the duration of ice retention of their Softpack coolers is equal to 5 days. After considering both these options we decided to make a conclusion that the winner in this battle is the RTIC coolers lineup. Having almost identical features these coolers have very different price. The cost of RTIC coolers is much less comparably with the Yeti line. We made such conclusion basing on the fact that there is no sense to overpay for the same characteristics and quality. If forget about only mercantile moment and to take into account all other features, the Yeti Hopper has all chances to become a winner thanks to its stylish design. With the modern look of Yeti cooler you will stand out from the crowd, so if you appreciate style and want to own something state-of-art and stylish, then the Yeti option will be better for you. We think that the style is important, but still the main accent should be made on the cooler’s quality, performance and price. Just because this fact we have made the RTIC brand a winner. Nevertheless, the majority of people buy cooler for its performance, not for its look. But it’s up to you and we can’t persuade you to change your point of view. All in all buying any of these products you will get high quality product for many years. You can be convinced in it by reading many highly-rated reviews about both these brands. Lunch Box from RTIC. Enjoy Your Meal Everyday With This Lunch Box. RTIC manufacturer offers small and large coolers, but there are many situations when some of us needs small and very portable cooler only for myself. For such purposes RTIC created a lunch box cooler for taking it to the works/school/college everyday. This personal lunch cooler can hold an ice during some hours that will be enough to keep your several bottles and sandwiches fresh and cold until you taste them. Small, convenient and effective. This RTIC Lunch Box is a very good option for frequent using. With measures only of 10” x 12” x 8” and weight of two pounds it will not be difficult to you to carry it to work every day. This cooler can hold up to six bottles with drinks and some sandwiches. This cooler is a perfect option for one person, or maybe you can even regale your friend with the bottle of icy lemonade. You can check the RTIC Lunch Box cooler on Amazon right here. This cooler can serve not only as a lunch box, you can take it to the morning fishing where you can keep your catch cold until you return home. 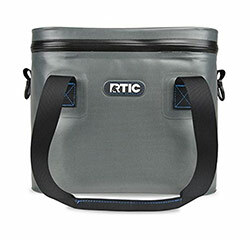 RTIC Lunch Box – soft sided cooler perfect for everyday use! One of users noticed that the capacity of this cooler is exactly enough to one person needs. He added that he took this option to the work everyday and can’t imagine his lunch hour without this cooler. One more user said that the performance of this cooler has pleased him greatly. He was satisfied with the durability and anti-sweat design of the RTIC Lunch Box. Where Can I Buy My Soft RTIC Cooler? The last moment we will clarify in this article is where you can purchase RTIC soft coolers. We all want to save our money and get a discount, so the best way to purchase these coolers is the Amazon where you will find attractive prices and many reviews from users. Also you will find there all sizes and models available. If you are interested in getting the high-end product at a very profitable price, you can follow this link. Also you can purchase these coolers at the official site of the RTIC manufacturer, but hardly ever you will find discounts or tempting prices there. Nevertheless, if don’t want to take a risk and want be sure that your cooler is not a fake, then follow this link to the official actual RTIC website. To finish this fruitful (we hope it to be so) review we want to state that if you want to get high-quality product with TOP characteristics and together with that not to spend a whole bunch of money, the RTIC Softpack Coolers is all that you need. We have presented to you the essential features of these coolers and hope that our information together with some users’ reviews will be a reason for you to stop your choice on this brand. We assure that you will not regret about this choice.